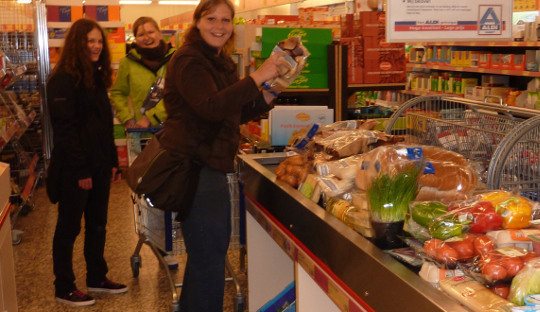 Where can I buy the groceries? Within a short time you will be boarding one of the clippers Poseidon, Aldebaran or Passaat for a sailing trip. The crew wishes you a welcome on board. 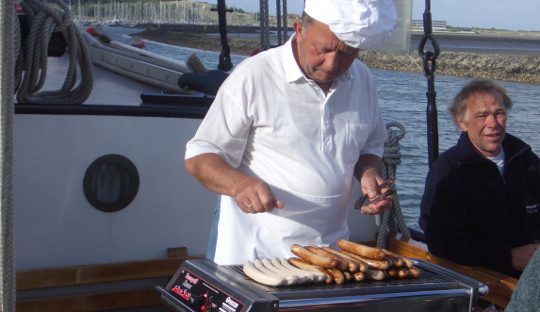 Life on board will be exiting and nonetheless one will have a relaxing time on the deck or help out in the galley, the other will help out sailing the vessel. Everything is possible. 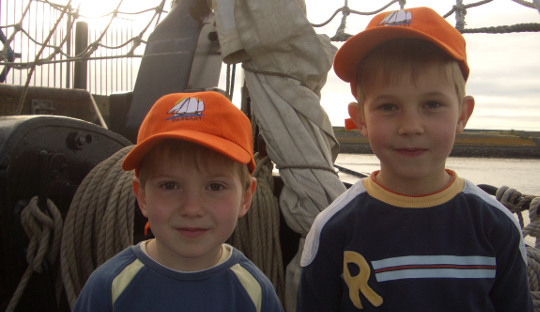 This letter will give you information about your trip on board the ship, and also gives you hints on the preparation, also it will give an initial introduction on sailing on a two mast Klipper. Make sure you check the boarding time which is stated in the contract. The crew will still be busy doing work on the ship when you arrive on board. Its possible to contact our office for all questions and remarks. 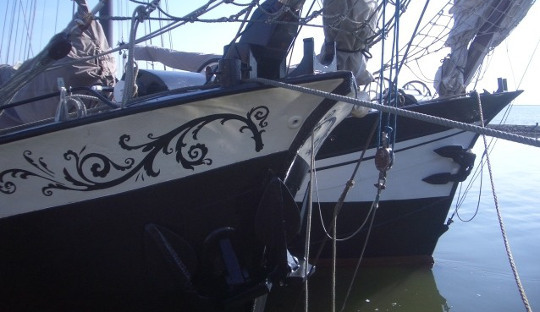 The sailingships are completely certified by the dutch shipping inspection. After you have boarded you will be instructed by the crew. When you are boarding the ship, be sure you are safe at all times, make sure you walk safely on the decks, and alway have one hand free for holding on to the ship. Be sure to oblige all instructions from the crew. In you cabin there is a safety plan where all emergency exits are listed, make sure you know them by heart. Insurance Our ship is fully insured, and the crew is 3rd party insured for our passengers. Its advised to bring you luggage in a soft bags, suitcases are harder to stow underneath the beds. The Poseidon has 14 cabins, the Aldebaran has 9 cabins and the Passaat has 10 cabins, the cabins have both cold and hot water running from the tap. Central heating is throughout the whole ship and in the cabins, the Aldebaran has underfloor heating in the cabins. There is storage for bags, and there are wall hooks for clothes. All cabins have their own portholes or windows ( Aldebaran), which have to be kept closed when sailing. In every cabin there is a 220V power plug which can be used for charging batteries and other small low powered gear. Be sure to inform the crew when you want to use a hairdryer or other high power machinery. The generator can be started for those instances. 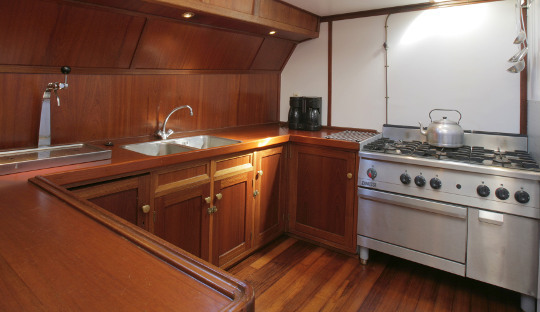 You will be able to cook on board in the galley which is fully equipped. There is a 6 burner gas stove with electrical starters, a 70 litre oven, heated cabinet, and a coffee machine 2 litre ( fitting filters are standard on board). A dishwasher ( Poseidon) , a fridge with 425 litre and a 130 litre freezer, a dishwasher. We would like to ask you not to eat food in the cabins. In the ships Passaat and Poseidon the toilets and showers are located in the middle of the ship. Each cabin of the Aldebaran has its own sanitary unit. They are for communal use. To ensure that the wastewater pump and pluming keep clear from any debris, we ask you to no put any sanitary towels tampons or any other foreign objects in the toilets. There are waste bins located in the toilets. Our toilets have economic flush system, please be sure you use that. Make sure you don’t waste precious drinking water and be resourceful with electricity. Smoking is prohibited throughout the whole ship. On deck you can smoke, but make sure cigarette filters are disposed in the ashtrays provided on deck. When there is rain, a shelter can be made so people can smoke in the dry. Seasickness is very rare, the waddensea is a sheltered sea, sandbanks prevent waves to build. The IJsselmeer is also not a very rough lake. The ships are very stable and thus not very affected by the waves. Good night rest and eating sufficiently can help you not getting seasick. 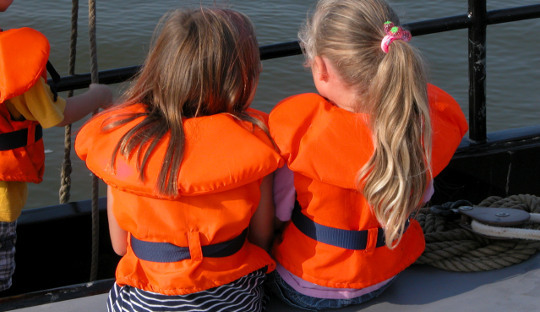 Children are welcome on board, children’s lifesaving appliances are on board for all ages of children. To make sure that all sizes are available in case there a lot of children, please call our office and tell us how many children with what weight. So we can make sure there are enough saving appliances. For babies its advisable to bring a cradle so the baby can sleep next to the parents in a cabin. For toddlers there are planks which can convert the normal berths can be made child save. On the ships the beds are made with under blankets, pillowcases, duvets and covers. Only the midweeks you have to take your own sleepingbag on the Aldebaran. On request you can order for a duvet for 12 € . Dishcloths have to be brought by yourself. Its possible to rent a towel set, for 7€ you will get 2 towels and 2 washing cloths. For walking on deck you should sport shoes or comfortable walking shoes. High heels are not done on a ship. For rainy days wellies are suitable. Take warm clothes, a cap, sunglasses and suncream. On the water it’s always colder then a shore. Zonnewind Sailingtrips offers an extra insurance, such as cancellation insurance or storm insurance. The maximum price for a complete supplementary package is 8% of the hire price of the ship. You can park easily and inexpensively at Willemshaven harbour in Harlingen for €6 a day. Reservations can be made via info@bds-harlingen.nl or on telephone number 0031 623372947. 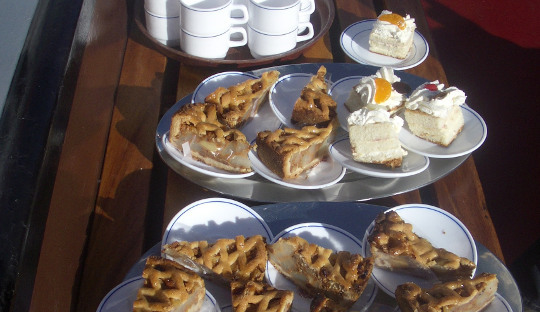 Ordering for catering or selfcatering?